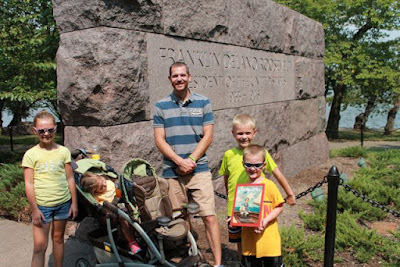 Our family attended the National Book Festival in Washington DC for the fourth year in a row over Labor Day weekend. Each of the past three years I have planned an author/illustrator birthday celebration during our time in the nation's capital. 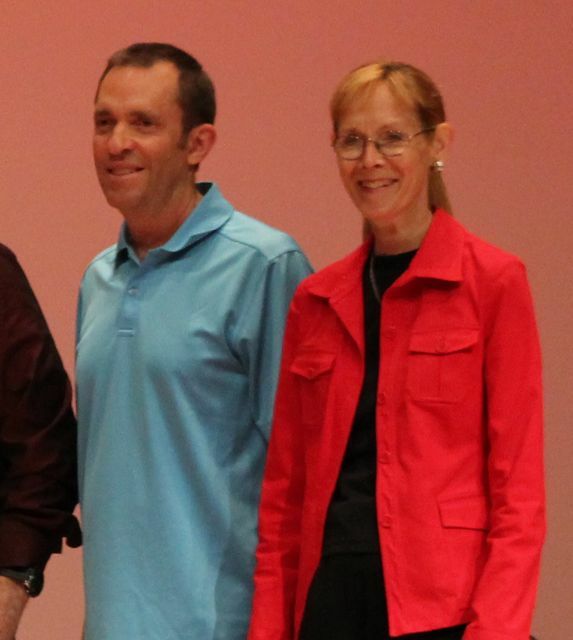 We celebrated Bob Staake in 2012, Andrea Davis Pinkney in 2013, and Paul Fleischman in 2014. This year, we continued the tradition with a birthday celebration for Lou Fancher; artist, writer, dancer, book designer, and illustrator. Lou Fancher has published over 45 books including My Many Colored Days written by Dr. Seuss, New York's Bravest written by Mary Pope Osborne, and It's Milking Time written by Phyllis Alsdurf. 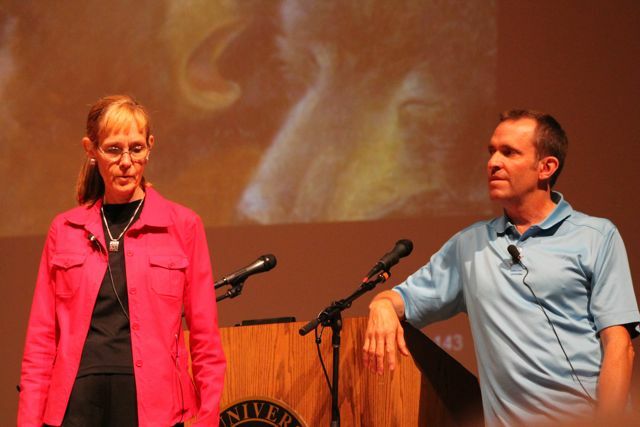 She has collaborated with her husband, Steve Johnson, on most of her books. Their collaboration in children's books began in 1989 when they published No Star Nights by Anna Smucker which was awarded an International Reading Association Children's Book Award for Young Readers. In addition to being a talented artist, Lou is a talented dancer. She studied dance at the University of Cincinnati and has worked as a ballet instructor and choreographer. Lou's dancing brought her together with Steve when he was photographing ballet dancers as reference for his artwork and Lou was at the ballet studio. Later, Steve offered her the painting he did of her and the rest is history. Lou and Steve's artistic collaboration is very unique. It is a "fluid" arrangement. Both artists paint on the same painting. Both may start paintings in the same book. They say, "It just depends on who is better at it." Their artwork also changes for each book. For example, they used potato stamping in Cat, You Better Come Home by Garrison Keillor, painted on fabric for The King's Taster by Kenneth Oppel, and incorporated photographs of their own family for BeBop Express by H.L. Panahi. They explained the reason for the variety in their work, "Our artwork is different for each book because the author's voice has been different in each one." In addition to creating children's picture book art with Steve, Lou has contributed as the author on three books including Star Climbing and The Quest for One Big Thing. Currently, she is writing for many publications in the California area and has two upcoming books with Steve Johnson; Dr. Seuss: The Great Doodler by Kate Klimo (January 2016) and Shh! Bears Sleeping by David Martin (January 2016). 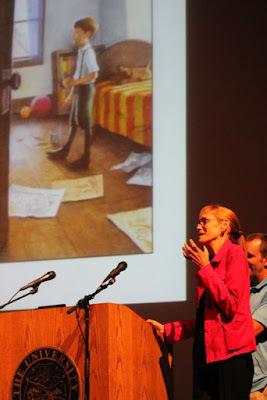 At the Mazza Museum Summer Conference 2015, Lou Fancher said The Polar Express by Chris Van Allsburg inspired her and Steve to want to make children's picture books. "Working together with Steve became addictive." "Together we can do things we can't do alone. If I work with him, I can do it." 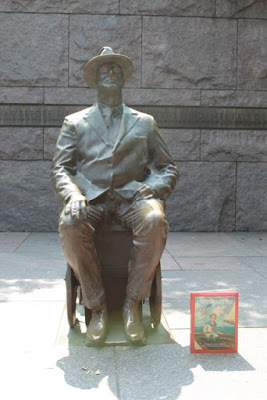 Our family had never visited the Franklin Delano Roosevelt Memorial in Washington D.C. and I thought it would be the perfect place to celebrate Lou Fancher's birthday by reading A Boy Named FDR, written by Kathleen Krull. In 1955, The Franklin Delano Roosevelt Commission began work to create a memorial "that will do him the honor he deserves and transmit his image to future generations." (National Park Service Pamplet). The Memorial was completed in 1997 and the Commission's goal was certainly achieved. Our family learned a lot about our 32nd president with the help of this amazing memorial and the perfect picture book. A Boy Named FDR chronicles Franklin Delano Roosevelt from birth until he started his campaign to run for President of the United States. FDR grew up in a very wealthy family. He had all the toys, teachers, and toilets he needed and then some (there were nine bathrooms in his house!). 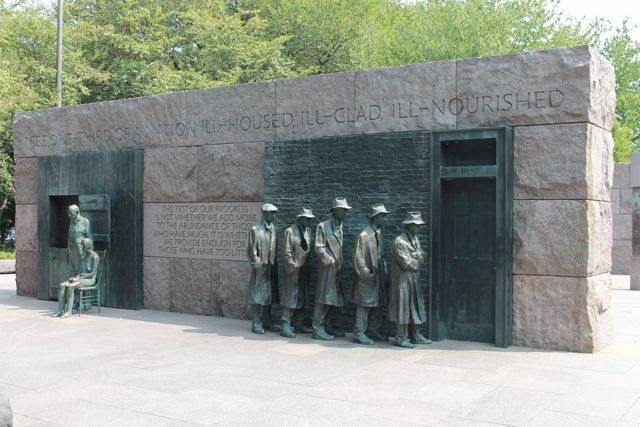 FDR learned many childhood lessons from his parents and teachers on the importance of caring for people less fortunate. Some of the greatest lessons came from his fifth cousin Teddy Roosevelt who taught him, "You are not entitled...much has been given to you; therefore, we have the right to expect much from you." At Harvard, FDR began expressing his aspirations to become President and it was there, his future wife, Eleanor showed him "how people lived, and he never forgot." After a successful start to his career as a New York state senator, at the age of 39, FDR came down with polio. The disease left him unable to stand without assistance. My son said after reading the book, "I guess you can be in a wheelchair and still be President of the United States." We visited the Bureau of Engraving and Printing before we visited the Franklin Delano Roosevelt Memorial. It was too much for my youngest daughter who fell asleep in the stroller. This photo was taken at the end of the Memorial. If you start at the beginning you will first come to the Prologue Room and then pass through four outdoor rooms, one for each of FDR's terms as President. "The only thing we have to fear is fear itself." - Franklin Delano Roosevelt, March 4, 1933. 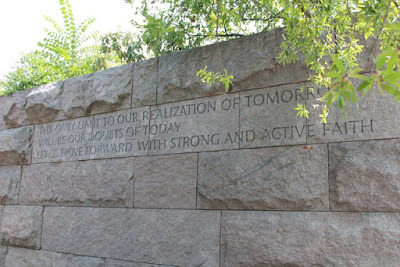 FDR said these words during his first inaugural address. 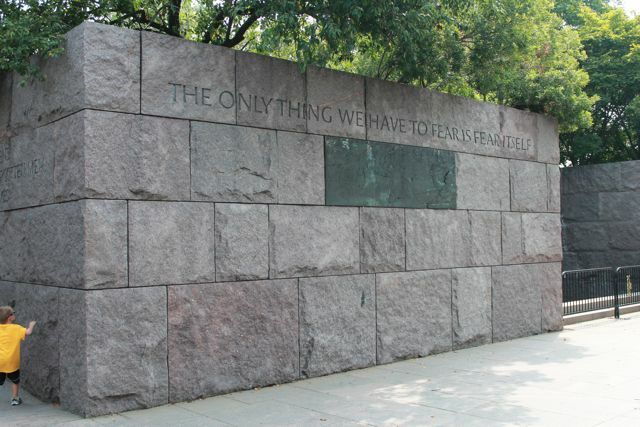 This quote is carved into the stone wall in Room 1 of the Memorial. This sculpture was designed by George Segal. It depicts a 1930s breadline. The quotes above and below read, "I see one-third of a nation ill-housed, ill-clad, ill-nourished." [and] "The test of our progress is not whether we add more to the abundance of those who have much; it is whether we provide enough for those who have too little." (January 20, 1937). This sculpture is in Room 2 of the memorial. 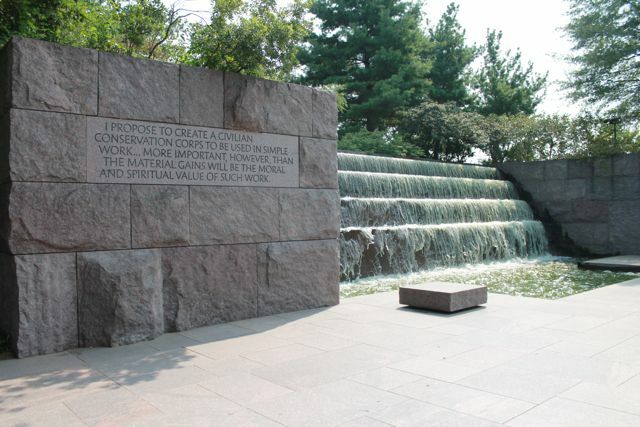 Also, in Room 2 of the Memorial is this waterfall. 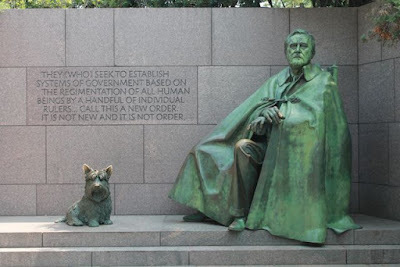 It is hard to miss the large statue of FDR with his dog Fala in Room 3 of the Memorial. 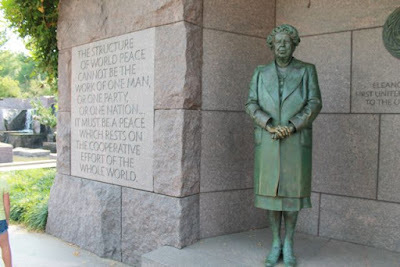 In Room 4 of the Memorial there is a statue of Eleanor. In A Boy Named FDR we learned FDR felt strongly that with Eleanor's help he could become someone who would make a difference in the world. Additionally, it was Eleanor that "urged him to get back into politics" three years after contracting polio. "The only limit to our realization of tomorrow will be our doubts of today. Let us move forward with strong and active faith." - Franklin Delano Roosevelt. This quote was from a speech FDR was preparing to give on April 13, 1945 for Jefferson Day, but he died on April 12th. Harry S. Truman took office after his death. This quote is in Room 4 of the Memorial. 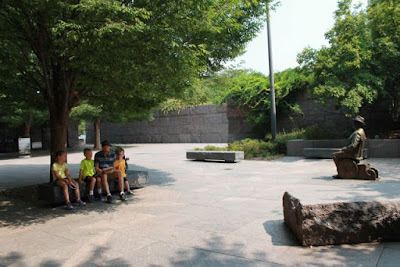 After touring the whole Memorial we returned to the Prologue Room to read A Boy Named FDR. We thought this was the quietest and most peaceful spot. It was the perfect place to read the book. Outside the gift shop, we saw this wheelchair which is a replica of the one that FDR designed and used. 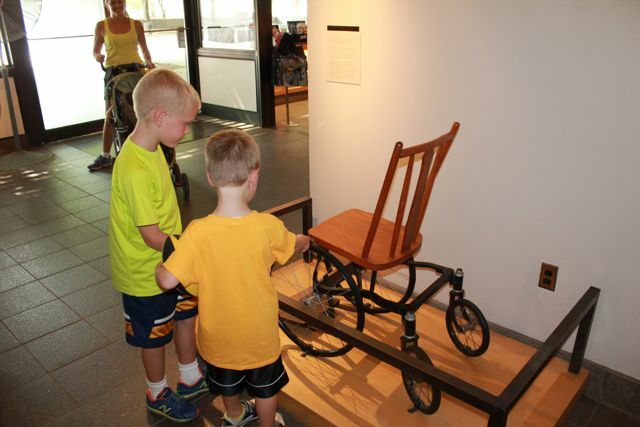 It was a combination of a commercial wheelchair and a kitchen chair! 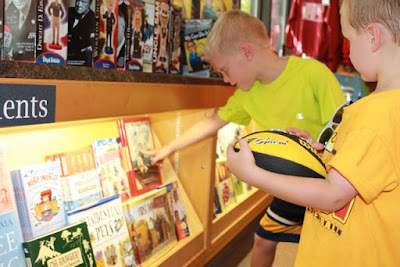 Before we left the Memorial we visited the gift shop. We were happy to see A Boy Named FDR was on the shelf! Lou, our family hopes you have a wonderful birthday! It was so nice to meet you at the Mazza Museum! 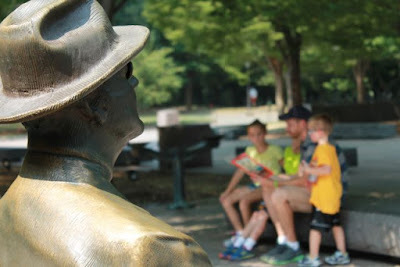 Would you like to read more about our experience at the National Book Festival in Washington DC? Click here!